Mission: The purpose of this animated opera program is to introduce opera to children in a fun and easy way. This program is meant to be sold to schools in order to enhance their music program in an economical and feasible manner. It will also be a good option to families who homeschool their children. This program will be a 20 minute condensed animated program encompassing the story and abbreviated musical numbers of the opera. After each musical scene there will be an option to click on a musical note icon which will bring you to a different screen offering the full musical number, musical information, sing-a-long texts and fun facts. This program will be tailored to different learning levels. Teachers may use their discretion on how much detail they would like to present to the students. There will be a teacher’s manual included in the packaging, plus options to download quizzes and musical numbers for the students. 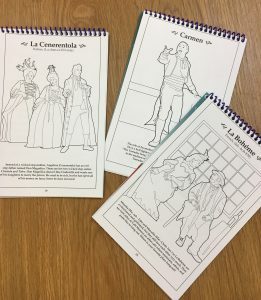 To help us raise the necessary funds to complete such a large project, we have created a coloring & activity book that highlights many of our past operas! Created by using actual production photos, as you flip through the pages you might see faces you recognize from our performances such as Season 10’s Carmen, Season 3’s The Barber of Seville, or Season 7’s Falstaff. Each page includes a few sentences that explains the the scene on the page. 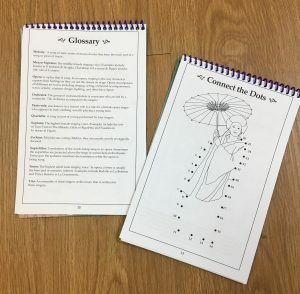 The book also includes activities such as word searches, mazes, and connect the dots! At the end of the book we included a glossary with popular opera terms used throughout the book. Below is a short introductory video about Operatoons. Enjoy! 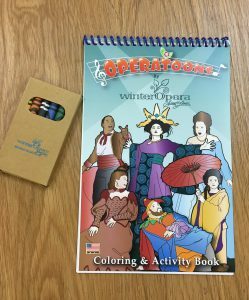 Thank you for supporting Winter Opera and our Operatoons program!